Homemade Worcestershire Sauce | What's for tea tonight dear? This entry was posted in Pescatarian, Recipe and tagged anchovy, black pepper, black treacle, Bloody Mary, cardamom, cheese on toast, chilli, Christmas, Christmas food, cinnamon, cloves, colatura di alici, condiment, garlic, Gary Rhodes, ginger, homemade, homemade Worcestershire Sauce, Lea and Perrins, mace, malt vinegar, nutmeg, porcini, recipe, shallot, soy sauce, tamarind, treacle, vinegar, Worcester Sauce, Worcestershire Sauce. Bookmark the permalink. 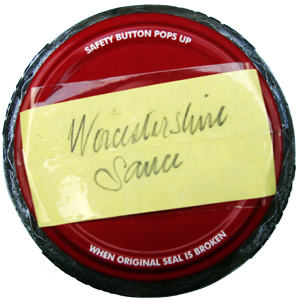 I used to love worsscesctershire sauce (!) when I was but a fledgling veggie all those years ago but now mushroom sauce is all I’m offered! What could I possibly substitute for those fiendishly salty little blighters that seem to be a key component in the whole worscescestershire experience? RJ – I’m not really sure there is a substitute for anchovies here. If I find something I’ll come back to you.